Everyone is talking about the news that Google announced yesterday that Google+ is no longer going to be required for other Google services. Google's Bradley Horowitz said in the blog post, "in the coming months, a Google Account will be all you’ll need to share content, communicate with contacts, create a YouTube channel and more, all across Google." That means, YouTube and other Google products won't need a Google+ account anymore, which is something that many users found confusing and upsetting originally. We decided it’s time to fix this, not only in YouTube, but across a user’s entire experience at Google. We want to formally retire the notion that a Google+ membership is required for anything at Google… other than using Google+ itself. Google+ can now focus on doing what it’s already doing quite well: helping millions of users around the world connect around the interest they love. Aspects of the product that don’t serve this agenda have been, or will be, retired. But you’ll also see a slew of improvements that make this use case shine. 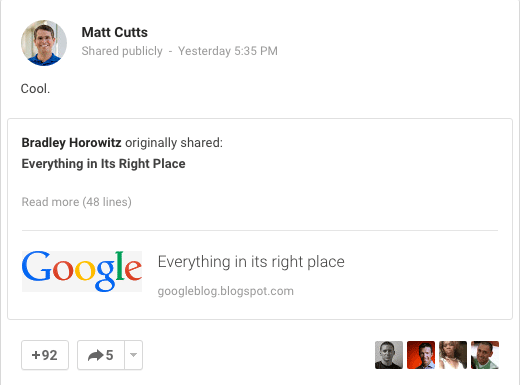 All signs still point to Google+ slowly dying but that isn't happening tomorrow. Forum discussion at Google+, Local Search Forums, WebmasterWorld and Cre8asite Forums.